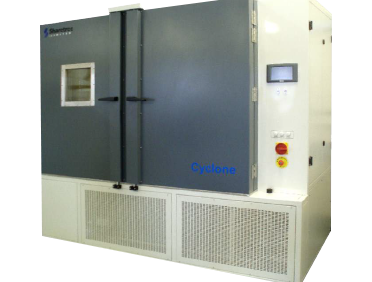 Environmental chambers suitable for both constant temperature/humidity and temperature/humidity cycling applications. Special attention has been given to achieving an evenly distributed air-flow to ensure consistent conditions throughout the chamber volume and therefore more meaningful test results. Standard chambers are available with two temperature ranges, using single stage or cascade cooling plant, and with the choice to increase ramp rates through boost heating and cooling options. The SIMPLEtouch touch-screen programmer makes it easy to set-up and monitor the chamber conditions, and is particularly useful for simplifying the programming of complex cycles.The chambers are attractively styled to blend in with modern production and laboratory equipment and available sizes cover a volume range from 216 to 1500 litres.